When: Friday through Sunday, June 27- 29. Festival goes from 10 a.m. to 5 p.m. on Friday and Saturday, and from 10 a.m. to 4 p.m on Sunday. Where: Lionshead, Vail. Open air with booths and entertainment throughout the entire area. VAIL — Over 80 artists have been selected to mark the homecoming of the Vail Arts Festival, taking place today through Sunday. The festival returns to the heart of the valley today from 10 a.m. to 5 p.m. and Sunday from 10 a.m. to 4 p.m. for its 30th anniversary. Displays of art will converge in over 13 different forms of media that are sure to entrance the artist found within us all. Festival­-goers will be able to observe as well as purchase art pieces ranging from metal, ceramics and digital media forms to wood works, glass and print work while surrounded by Colorado’s natural beauty. This year features art from glass artist Diana Zombola from Colorado Springs and her exhibition entitled “Rhapsody in Glass.” Zombola has been eager to get into the Vail festival for a number of years, but this will mark her first appearance. A newcomer to the show, Zombola has been labeled as one of the emerging artists to keep an eye on. Zombola said her work aims to give the viewer a unique perspective every time they look at it. The combination of light and the colored glass interact to create an entirely new piece with every angle and ray of sunshine, adding to the endless possibilities of beauty. Not only does Zombola work with glass, but she is also a musician at heart and a definite must-see when visiting the Vail Arts Festival. Along with Zombola’s glass work, Gypsum-based artist Carmel Walden will be dazzling the festival with watercolor paintings that are in a class of their own. With pieces in more than 20 shows each year, Walden said she enjoys the opportunity to engage in such a high caliber event so close to home. Working with such a pure and transparent medium, nearly every stroke Walden places on the paper adds a fantastic effect that occurs in almost no other medium — each stroke is distinctive in the final piece. 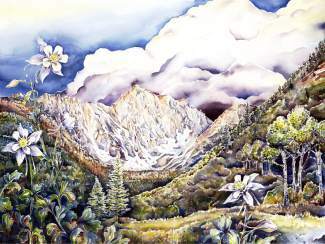 Walden said that the surreal images created each contain a bit of her personality, something that is distinctive with the impetuous effects allowed by watercolors. New additions to the festival this year will include an Emerging Youth Artist Contest following the festival’s overall theme of “Engage with Art.” Participants between the ages of 3­-12 with a spirit of creativity are encouraged to submit their work along with a short video demonstrating their unique style of work and why they should be selected as the Emerging Youth Artist. Voting will be conducted via the event’s Facebook page (face book.com/VailArtsFestival) concluding with the winner’s piece being featured in the Kid’s Creative Kingdom during the festival. The winner will also receive two children and two adult passes to Vail’s Adventure Ridge as well as a $50 gift certificate to Blue Moose Pizza. The outdoor festival takes place in Lionshead and is free to attend. Free children’s activities and entertainment will also be provided in the Kid’s Creative Kingdom.